Melt Clarified Butter in a medium pot over medium heat. Add oysters and saute in butter for several minutes. Add milk to the oysters and stir until heated through, almost boiling. Add salt, taste and adjust salt as needed. 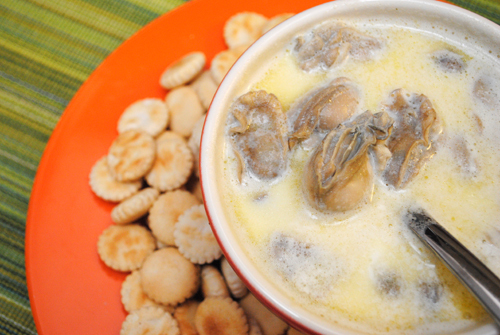 Divide stew evenly between two bowls, starting with oysters first, then ladling in liquid into each bowl a small amount at a time to ensure even distribution of oysters.